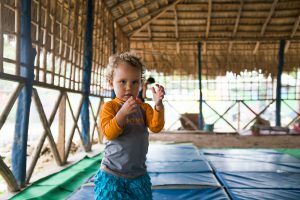 Jiu Jitsu de la Costa is located in the heart of Cabarete and has just opened it’s new jiu jitsu academy in the Callejon de la loma. Always offering Jiu Jitsu classes for all levels, Tomas “Papo” Soñé the founder and owner will also be offering new classes to the public. The new location is right behind Aquarius Pizza Cafe and the old Voodoo Lounge (now called Chabola). It’s former location is still open and now has some exercise equipment as well for those interested in weight training. The school’s mini-gym has a barbell, squat rack, dumbbells, pull up bar, and jump ropes. Papo Tomas, originally from Santo Domingo, started his Jiu Jitsu academy in Cabarete in 2011. Dedicated to the community, Papo has been offering his knowledge to anyone interested and dedicated enough to try. Martial Arts is a great outlet for relieving stress due to the exercise involved, but it is also a way to get to know yourself and grow stronger not only physically but mentally as well. Using Jiu Jitsu and Mixed Martial Arts as a tool, Papo has developed many youth into well respected and professional members of the community. All kinds of people like to practice martial arts for many reasons, most obviously because it’s a great form of exercise, but also there’s something special to gain from arts like Jiu Jitsu or Boxing that you can’t get from fitness classes or lifting weights. Staying calm is a major part of practice which is why martial artists develop excellent emotional control that often bleeds into every other area of life. Fear nor anger will serve you when you are combating someone else so learning to control those emotions is key. In addition to the emotional and physical, the social element of a martial arts training center is highly beneficial too. Everyone is welcome to practice, everyone is respected no matter their abilities, and everyone present had to start from the bottom to learn the art. The mutual respect for all and camaraderie found in martial arts creates strong bonds and friendships, builds self esteem and confidence, and gets you into exceptional shape along the way. More Detailed Surf Conditions & Webcams for Encuentro at surf-forecast.com.